Last year, I attended Loncon. It wasn't the first genre / fan convention I've ever been to, but it was the first big one. It was lovely - so lovely, in fact, that I immediately looked for other similar gatherings to book and attend. One fairly prominent one appeared to be Dysprosium / Eastercon, so I bought a ticket. In some ways, that was a slightly premature purchase: I've only read a couple of Jim Butcher novels (and didn't really like them very much), and I'd never heard of the other guests of honour, except for one filking concert I attended at Loncon. So I figured it's time to read up on Dysprosium Guest of Honour Seanan McGuire / Mira Grant. My choice of novels is a little restricted - for some mysterious reasons, most of her work does not exist on Kindle in the UK. Feed, fortunately, does. I have not read many zombie apocalypse novels (one and a half, to be precise), but I have watched a few films. Feed is unlike any of them. It's not so much a zombie apocalypse story as a novel with a post-zombie-apocalypse setting. It does not, however, read anything like a postapocalyptic novel. The zombie apocalypse has happened. People (and large animals) who die now immediately turn into flesh-eating zombies. The long-dead, however, do not rise from their graves. This was a massive catastrophe for mankind, about twenty years ago. By the time of this story, the world has adjusted. There are many safety precautions, frequent checks, and areas get a safety rating that determines who may or may not enter, and how armed any person entering those zones has to be. All in all, this is a world where everyday lives have re-established themselves. Civilization has survived the apocalypse. So have video games, the internet, TV, the government and the political process. Which brings me neatly to our heroes - a brother-sister duo of bloggers. They're blogging for a larger conglomerate at the start, but hope to start their own independent media outlet. In this world, the most thriving and proactive journalism has long moved from mainstream media to blogs. Then, they are selected to accompany a Republican senator's presidential campaign. Jackpot! Feed grabs you right from the start and keeps you engaged all the way through. The characters are interesting, their adventures get progressively more exciting and by the end it's a tense page-turner that might rob you off sleep and give you bad dreams. All the while, there's some banter and humour and a real buzz. These are young people, excited to make their mark on the world, and the excitement catches. It's fun and thrilling and at times even scary - everything a zombie story should be. The book reminded me of the novels of Cory Doctorow. Like in Doctorow's novels, there is a dollop of wish-fulfilment literature about some aspects (I can imagine bloggers becoming mainstream sources of info, but I can't imagine the 'fictionals' being a pillar of that success), and the benevolent super-senator character could just as easily have escaped from the pages of Makers. Or, having just checked the respective publication dates, the bloggers and benevolent funder in Makers might just as well have escaped from the pages of Feed and influenced Doctorow - apparently, Feed was published a few years earlier! 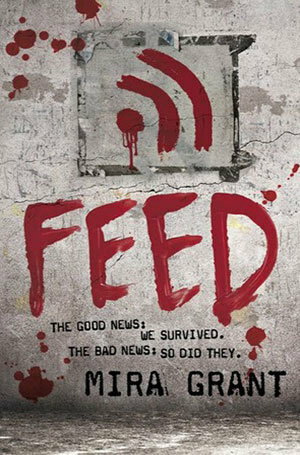 On the other hand, Feed is not quite as infodumpy, and a lot more interested in keeping you thrilled and entertained with zombies than in educating readers and entertaining you through techy awe. Aside from the wish fulfilment angle, the only flaws were inconsistencies. The biggest of those are the excerpts from the blogs. Unfortunately, these don't match what the bloggers purport to be doing. They read like today's blogs, not like they would be anyone's preferred source of news, information and entertainment. This is meant to be a world where mainstream media are being displaced by bloggers producing more ethical, honest, forthright and compelling content - but the samples given in the text read too much like amateur blogs today, ranty and preachy and not all that factual. Instead of building up buy-in to this world, they eroded it a little for me. The second notable inconsistency was the politics of the Republican senator. He does not come across like a Republican of any sort. I kept wondering when he'd do or say something Republican-y, but he never does. Those grumbles aside, it is a superbly entertaining, clever and original novel.